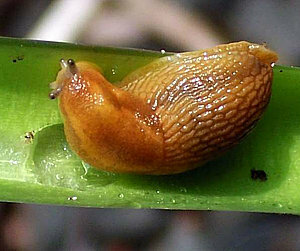 Slugs and snails tend to come in waves in the early season. First to show up are the overwintering adults. There aren't too many of these. Eggs also overwinter and the young ones that hatch from them show up about a month later. They have a mouth part that grates away at the leaves and petioles leaving holes that are scraped open showing white areas around them. The most effective treatments are the slug baits. The metaldehyde baits in small blue pellet form are best, and the iron phosphate baits are effective too. Both are poisonous and must be scattered very thinly and stored safely. Both can kill and have killed pets so they must be taken seriously, but used properly they are pretty safe in the garden. There have been reports of birds eating the iron phosphate pellets, so try to put them under the hosta leaves and not out where birds will see them. Keep pets out of treated areas and away from containers. Of the home remedies the most effective is ammonia sprays at about 9 parts water to 1 part ammonia, which will kill on contact Don't spray on hot sunny days as it can damage leaves then. Also effective and kinda gross is the beer in dishes method. Diatomaceous earth will work, but only until it gets wet. Copper can be somewhat effective. Coffee grounds, eggshells, and other grainy material does not work. Some report garlic sprays can work. In the Garden: As soon as the weather begins to warm the first overwintering slugs become active. Apply bait or other methods then, and again in 4-6 weeks to control new ones hatching from eggs. Spot treat as necessary the rest of the season. In the Nursery: Deadline M-P is the best product. Apply early. Keep pets out of treated areas.